We’ve previously discussed the things you should keep in mind before opening a demat account and why you should open a trading account in the first place. A trading account is equally essential – it is used to place buy and sell orders in the stock market whereas a demat account holds all the securities you transact. 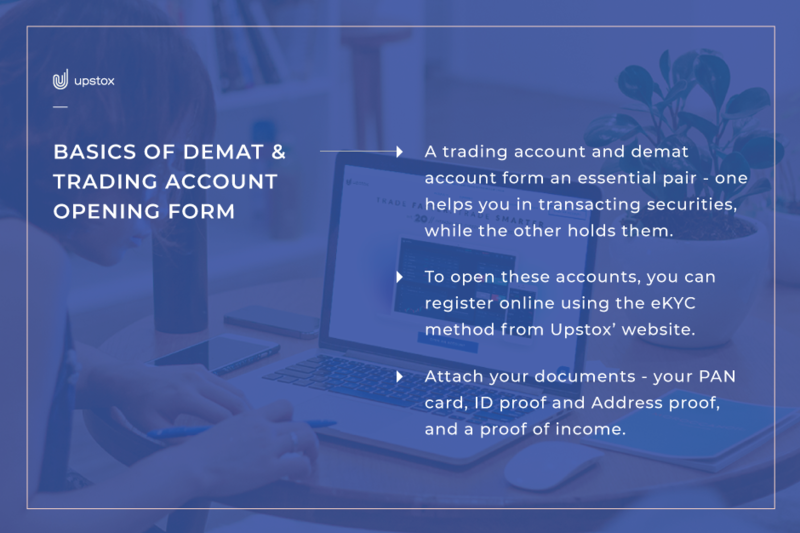 As with any other registration, opening a demat and trading account requires you to fill a form – the account opening form. A trading account is equally essential – it is used to place buy and sell orders in the stock market whereas a demat account holds all the securities you transact. You don’t need to deal with any paperwork if you’ve got your mobile number linked to your Aadhaar card. If you haven’t had a look at our demat account opening procedure guide or our trading account opening procedure guide get yourself up to speed. The basic steps involve selecting a broker that works best for you – likely to be a discount broker. This is followed by registering either online (using the online demat account opening form) or via an offline account opening form. Once you’ve filled in the details, attach the required documents and submit. That should be enough to get started! e-KYC method (paperless method): You don’t need to deal with any paperwork if you’ve got your mobile number linked to your Aadhaar card. Using Upstox’s online demat account opening and eKYC registration, your credentials can be verified online and you should be good to go, all paperless. The traditional method is done in an old-fashioned way. Your broker will hand you a demat account opening form and KYC (Know Your Client) form or you can download those forms. These forms are to filled by you and submitted personally, along with the required documents we’re listing out below. Any identity card which is issued by the Central or State government. A copy of ITR submitted to the Income Tax Department. A copy of annual income audited by a chartered accountant. A trading account and demat account form an essential pair – one helps you in transacting securities, while the other holds them. To open these accounts, you can register online using the eKYC method from Upstox’ website. Remember to attach your documents – your PAN card, ID and Address proof, and a proof of income!